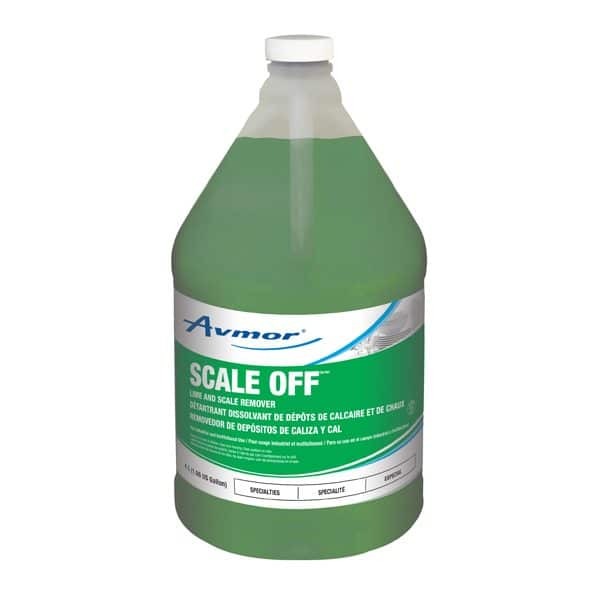 SCALE OFF is a premium lime and scale remover for dishwashing machines, coffee urns, stainless steel surfaces, glasses, steam tables and teapots. LIGHT DUTY SOILS: (1:50), 19 ml/946 ml, 0.6 oz/32 oz. MEDIUM DUTY SOILS: (1:7), 118 ml/946 ml, 4 oz/32 oz. DISHWASHING MACHINES (in a full tank depending on accumulation of scale): 500 ml – 1.5 L/tank, 16.9 – 50.7 oz/tank. 1) Apply solution on a microfiber cloth or apply directly onto surface or soak the item to be cleaned. Let stand for a few minutes or longer if necessary. Agitation may speed up the cleaning action. 3) Rinse thoroughly with potable water.